This Safavieh Courtyard area rug is sure to make a statement in any room of your modern home. Made from plush synthetic material, this indoor/outdoor rug is high quality and extremely fashionable. A durable product is assured with this machine-made rug. This red rug has a stylish floral plants pattern for your modern dicor needs. This Safavieh Courtyard area rug adds a touch of modern flair to the design of any area in your home. Complete your home's contemporary design with this indoor/outdoor rug made of plush synthetic material. Modern style and construction is combined in this machine-made rug. The geometric pattern on this orange rug is very modern and stylish. 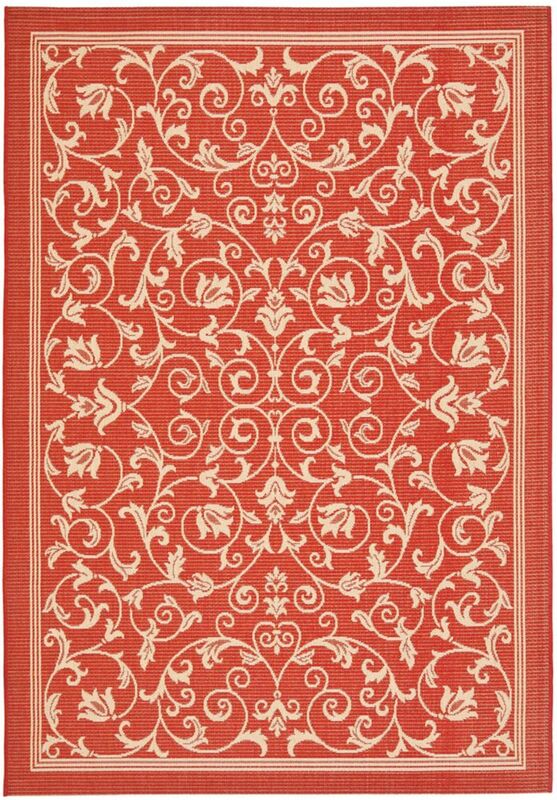 Courtyard Marc Red / Natural 6 ft. 7 inch x 9 ft. 6 inch Indoor/Outdoor Area Rug This Safavieh Courtyard area rug is sure to make a statement in any room of your modern home. Made from plush synthetic material, this indoor/outdoor rug is high quality and extremely fashionable. A durable product is assured with this machine-made rug. This red rug has a stylish floral plants pattern for your modern dicor needs.